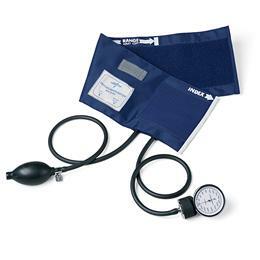 Medline Handheld Aneroid Features Nylon Rangefinder Cuff For Quick Fitting Of Patients. Our Two Handheld Aneroids Offer Lightweight Design, Portability And Durability. The Field Adjustable Unit Has No-Stop Pin Action For Visual Calibration Checks That Ensure Accuracy. Bladder, Tubing And Bulb Available In Choice Of Economical Pvc Or Rugged Neoprene. Pvc Adult.